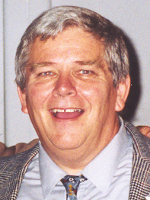 ALBANY – John J. Mullen Jr., 70, passed away on Wednesday, December 2, 2009 at the Julie Blair Nursing Home in Albany. Born in Albany, NY on January 2, 1939, John was the son of the late John J. Mullen Sr. and Clara Rifenburgh. John graduated from Christian Brothers Academy in 1958 and was a veteran of the United States Air Force. He worked for 33 years at the NYS Department of Tax and Finance, specializing in computer programming, before retiring in 1995. John was well known for his wonderful sense of humor and he brought a smile to everyone around him. He was once very active in Pop Warner Football in Rensselaer and enjoyed fishing and collecting model trains. He also loved being around his grandchildren. John is survived by his beloved wife of 47 years Charlotte Mullen; his children Deborah (Richard) Baker of Saratoga Springs, John (Neilene) Mullen of Delanson, and Karen (David) Bielawa of Amsterdam; his grandchildren Jordan, Daniel, Kelly, Lynne and James; and his great grandchildren Kyle and Kennedy. He was predeceased by his sister Jenne Mullen. A Mass of Christian Burial will be celebrated Monday morning at 9:30 in All Saints Catholic Church (formerly St. Margaret Mary’s Church), Homestead St., Albany. Relatives and friends are invited to attend. Inurnment will follow in Holy Sepulchre Cemetery, Rensselaer. In lieu of flowers, donations can be made to the American Diabetes Association, 2 Pine West Road, Albany, NY 12205; or to the National Kidney Foundation, 99 Troy Road, East Greenbush, NY 12061. To leave a message of condolence for the family, or view or print a prayer card, please visit www.HansFuneralHome.com. Offer Condolence for the family of John J. Mullen, Jr. I am so sorry about the loss of your dad, Karen. What a beautiful smile he has in his picture. I remember what a fun sense of humor he had when I met him during your wedding. I know you will miss him terribly…but you have many good memories that will live on in your heart. We are very sad about the loss of your dad, Karen, and of your father-in-law, David. He was a nice guy, always very supportive of us during our times of trouble. We’re glad to have known him, and he will be missed but will be in our good memories. Our very best to you and your whole family. Karen & David – We are so sorry for the loss of your dad. It seems not that long ago David was going through this. You have had a rough year. May the wonderful memories of your dad keep this season bright for you. May you feel peace knowing he is without pain or suffering now. We love you guys. We are keeping you in our thoughts. I am so sorry to hear of John’s passing. John was such a pleasant, hard-working person. Some of my best memories of working at Tax were the years that I worked with John. Ann… I know this is the toughest of times for you but please find comfort in knowing that there are so many people who have such fond memories of their time spent with John. Our thoughts and prayers are with you and your family.